Wendy's 3-D Cats: HAPPY BIRTHDAY, DOMINO! Today is Domino's birthday, though she doesn't want to say which one. She's at that age where she'd rather keep it a secret -- especially since she's dating a much younger mancat. Does that make her a cougar, she wonders? She doesn't really look like a cougar. In fact, Domino looks remarkably young for her age, and she's in great shape according to the vet. It must be because she takes such good care of herself. She must, for her modelling career, after all. For her birthday, Domino received some wonderful gifts. First of all, Daddy bought her this marvelous new kitty bed -- in pink (her favourite colour). Mommy bought Domino a new dress for her birthday. She gave it to her yesterday so she could get some pictures to post today. Here she is in her lovely new, very feminine frock. It has quite a large collar trimmed with lace. And on the collar, is a beautiful deep pink rose. As Domino relaxes between takes (Mommy snuck this one in), you can see the dress in its entirety. The bodice is a pale pink with accents of black on the lace trim at the waist. The skirt is two-tiered black and white gingham, again trimmed in lace. You can't get much more girly that this! Here Domino poses with her Daddy, who is giving her birthday hugs. Here, the birthday girl looks simply adorable. But the bestest present of all was Milo! He came to give her some birthday love in PURRson, before taking her back to Sidmouth with him. It's his brother Alfie's birthday today, too, and they're all going to celebrate together. HAPPY 2nd BIRTHDAY TO YOU, ALFIE!!! Just click on the link above to visit Alfie and give him birthday wishes and to join the party. 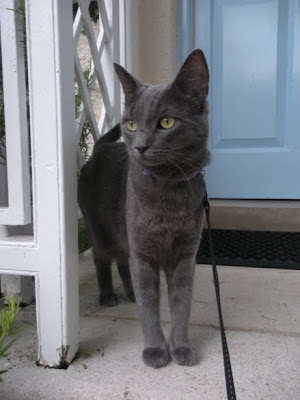 HAPPY 10th BIRTHDAY DEAR MOMMY CAT!!! HAPPY 5th BIRTHDAY SWEET ROXY!!! September 1st must be a very good day for birthdays, because some of the nicest kitties have their birthday today. 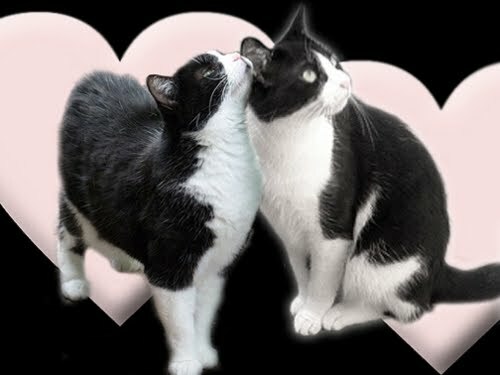 We wish them all much happiness, love and contentment -- PURRhaps with a little nip and tuna thrown in for good measure. HAPPY BIRTHDAY DIMINO !! You look so pretty in your birthday dress, and love your new pink bed ! The picture of Dad giving you a birthday hug is so cute !! Sweet beautiful Domino, Happy Birthday and wishing you many happy returns of the day! You are such a special girl and look just lovely in you new birthday dress. All my kitties are here and want to celebrate with you! 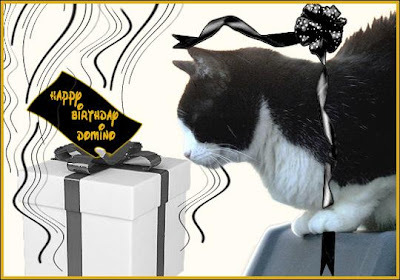 Happy Birthday beautiful Domino, from us all. Milo sends yoo extra special love! Happy birthday, Domino! You look absolutely divine in your lovely new dress! We wish you a wonderful day filled with lots of treats and cuddles, maybe even nip! And we wish you many, many more birthday celebrations to come! Happy birthday Domino. We hope you have a wonderful day. Happy Birthday Pretty Domino! You look especially smart today. We hope you have a wonderful time at Alfies party and get some extra smoochy time with Milo too! Happy Birthday DEAR DOMINO! Not letting us know your age! Well aren't you the coy cougar! Hope your day is fun-filled with all of your faFURite things! HB to all the other BD cats too! Hi Domino! Happy Birthday!! We can't wait to see you over at Alfie's party but we wanted to sing you our favorite birthday song! You look so cute in your new outfit, and that picture of you with your daddy shows just how happy you are - you are totally smiling in it! We hope you have a wonderful, fun, treat filled day!! Happy Purrthday beautiful Domino. You look especially lovely in your new pink dress...you rocked that frock! Happy to all of those kitties! That pink, black, and white dress is very classy! Happy Birthday, Domino! We wish you many more to come. That kitty bed looks very comfy, what a great present. Happy Birthday Domino!!!! I hope that you get lots of wonderful treats and good cuddles. You look lovely in pink - and so young! Happy Birthday sweet girl. Happy birthday, Domino! It looks like lots of kitties are having birthdays today, but yours looks especially sweet! Happy birthday, beautiful Domino! I love your pretty birthday frock. Happy Birthday, Domino! It is a Lady's right to keep her age secret! Happy Birthday, Domino. Love your new dress. Oh, Domino! You gorgeous, fabulous lady! Happy birthday to you. And you are absolutely correct..... a lady never tells her age and a gentleman never asks. We are a large family of cats and have come to help you celebrate your special day. Wishing you all of the love and happiness life has to offer and all of your favourite treats too. (And we are glad to meet Mr. Marshall's very own love.) When mum first saw you, she started to tear up because you look so much like the female version of the cat love of her life, Arthur. What a couple you would have made exquisitely dresses in your nature given formal wear. Heaven! You look absolutely stunning in your new birthday frock,and oh that new pink bed is fabulous! I could see the kitty smile on your face. Enjoy your special day sweet Domino. Happy Purrthday you Purrty Gurl! Happy Birthday Domino! You look purrty in your new dress and we hope you and Milo have a very special birthday celebration together. You look ever so fetching in your new dress my dear!! Happy Birthday, Domino! You look fabulous, whatever that certain age may be! Hope you don't mind that we showed up a bit late to your party Domino! We believe in Birthday Week! With 9 of us kitties we're bringing you a whole new party!